The Bude Town Trail starts at the Bude Tourist Information Centre where there is ample pay and display parking and several restaurants and cafes. The circular route is approximately 4 miles (6.4km) and will take between two and three hours. Leave the Tourist Information Centre and head left onto Bude Canal. Bear right to the Bridge and cross the road carefully. Head towards the Falcon Hotel. Take the lane leading to the Parish Church of St Michael and All Angels. Continue along “Church Path”, until reaching a stile by the gate on the left, the cross onto Efford Down. Head for the tower on the skyline known locally as The Pepper Pot. Head back towards the town along the Coast Path from where there is a good view of the Breakwater, Chapel Rock and the Haven. Follow the Coast Path to a kissing gate and go down the steps to Efford Cellars. Shortly after you will come to some steps on the left leading to the Sea Lock Gates and Bude’s former Lifeboat House. Cross the Canal via the inner Sea Lock and follow the towpath past the Old Canal Forge on the Lower Wharf. Bear sharp left and enter into the grounds of the Bude Castle and Heritage Centre. On leaving, note the Bude Light sculpture, and bear left to skirt the Recreation Ground and the Central Methodist Church. 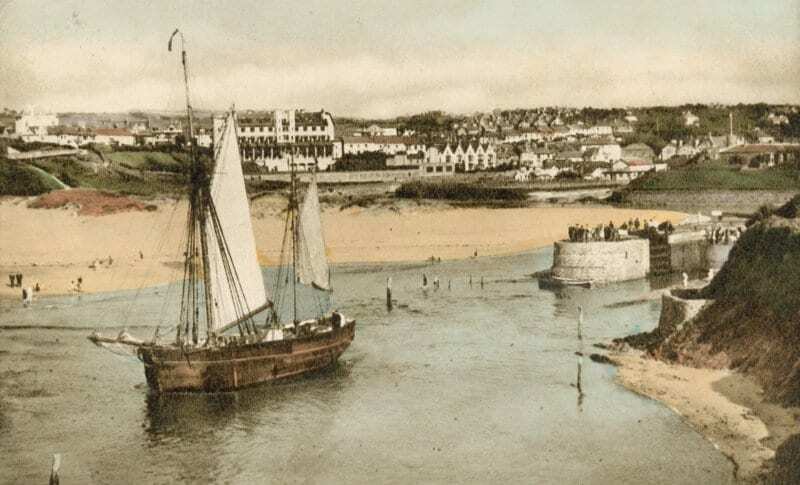 Continue past Leven Cottages and cross the river Neet using Nanny Moore’s Bridge. Cross the road and climb the steps to Grenville Terrace. Turn left and follow the path below Adventure International. Cross the road and continue towards the sea along Summerleaze Crescent, then take the cliff path to the Bude Sea Pool. Head Inland to Clifton Memorial Stone. Continue towards the Flag Pole, past the memorial to the American 2nd Ranger Battalion and over Sumerleaze Down towards a narrow lane between the buildings. Before reaching Sainsbury’s, cut down right between the houses and turn left. At the end of Summerleaze Crescent, proceed down Belle Vue towards the Town Centre. Turn sharp left opposite the Post Office into Princes Street, then wal down to the end of Queen Street. Across the road into King Street, a cul-de-sac. Proceed down Lansdown Road. On the left hand side of The Triangle there is a small lane that leads out to The Villa. Head down to the river Neet, then turn left on to The Strand. Continue past The Globe and the Carriers Inn until you reach Bencoolen Bridge, then walk back to the Tourist Information Centre. The curved row of cottages opposite is called The Crescent. Just before the Tourist Information turn left across the riverbank and you are now in the Bude Marshes Local Nature Reserve. You will soon reach an old railway bridge. Turn left, over the bridge and immediately right to join the path that skirts Etheric’s Mill Marsh. At the next junction turn right and walk across Truscotts Bridge, then right again onto the Canal towpath which will take you past the Upper Wharf and the Old Lifeboat Station on your way back to the Tourist Information Centre.